Ladies silky cotton blouson top. Machine wash. Sizes 8-24. "Lovely feel perfect fit this style is easy to wear this is my 4th purc ..."
Ladies comfortable pull on style blouson top with three quarter length sleeve designed to cover the elbow. Flattering ruched shoulders and a broad welt. 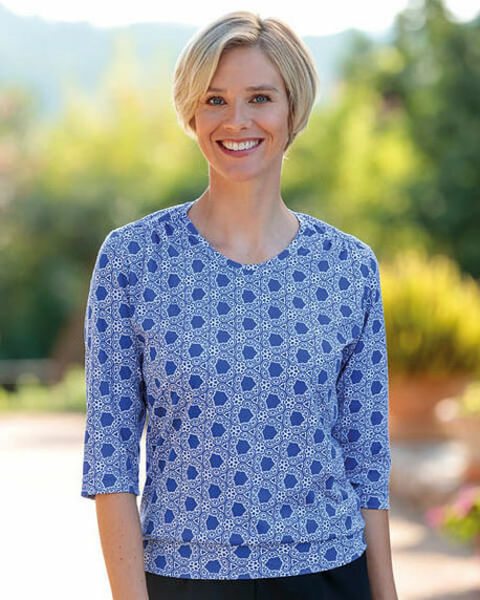 Easy to wear and luxuriously soft pure Austrian silky cotton jersey with a distinctive sapphire blue design on a white base.An all time classic for the warmer months.